Matthew Broderick plays the title role in Ferris Bueller's Day Off, (for those a little slower than most, that is he plays Ferris Bueller). 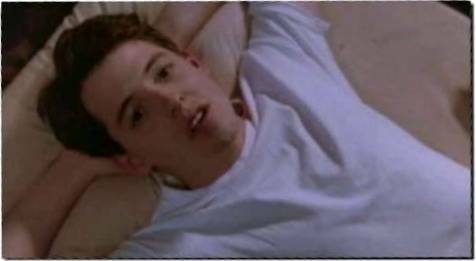 Charming, irresistable, cunning and manipulative, our hero Ferris Bueller, starts the film, by deciding to take his 9th "sick" day from school this semester. After outwitting his parents, he teams up with his girlfriend Sloane Peterson and best friend Cameron Frye, for the ultimate day off school, the whole time outsmarting not only his parents, but his sister Jeanie Bueller and school principal Edward Rooney. Born on the 21 March 1962, in New York City, New York to the late actor James Broderick (I) and playwright Patricia Broderick, though he was playing a highschool senior Matthew Broderick was actually 23 years old when FBDO was being made. Broderick initially took up acting at New York's prestigious Walden School after being sidelined from his athletic pursuits (football and soccer) by a knee injury. He debuted on stage at age 17 in a workshop production of Foote's On Valentine's Day with his late father, James Broderick. Broderick's career accelerated with parts in two Neil Simon projects: Brighton Beach Memoirs (1982-83), the first in the semi-autobiographical trilogy, wherein Broderick created the part of Eugene, a character based on Simon as a youth, and the feature Max Dugan Returns. He won a Tony for the play and positive notices for his feature debut. Broderick reprised the role of Eugene in Biloxi Blues, the second installment of the trilogy, for both the Broadway production and the 1988 film adaptation helmed by Mike Nichols. The same year as Max Dugan Returns Broderick had his first big screen success as David Lightman, a young hacker who almost starts a nuclear war in the 1983 film Wargames. Since then he has had his fair share of hits and misses at the cinemas, with some of his better films including Project X with Helen Hunt, the highly acclaimed Glory with Denzel Washington, Morgan Freeman and Cary Elwes, Mrs Parker and the Vicious Circle and Addicted to Love with Meg Ryan. He also voiced the character of adult Simba in the Disney classic The Lion King, and Broderick says that during that period he would get sick of children asking for him to sign "Simba" instead of his real name. Other films he has appeared in which may be known but not so much respected include Ladyhawke, Family Business with Dustin Hoffman and Sean Connery, The Freshman with Marlon Brando, Out On an Limb with FBDO co-star Jeffrey Jones (Ed Rooney), The Night We Never Met, and The Cable Guy with Jim Carrey (which got him nominated for the MTV best fight award for the medieval sequence) and the MTV film Election with Reese Witherspoon. His most recent box office success, but critical flop was of course the special effects blockbuster Godzilla, which gave Matthew Broderick his first action figure. Should any Godzilla sequels be planned, Broderick is under contract for 2 more. In 1995 he returned to the stage in the role of J Pierrepont Finch in How to Succeed in Business Without Really Trying, and for this his won his second Tony award as Best Leading Actor in a Musical. In 1996, Broderick took on the challenge of being co-producer/director/actor in Infinity, a biopic about Nobel prize winning physicist Richard Feynman, with the screenplay written by his mother, Patricia Broderick. Additionally he has shown his comic prowess by twice hosting Saturday Night Live. Most recently in February of 1998 and his first attetmpt was ten years before in 1988. Since May 1997 he has been married to his H2$ co-star and girlfriend of 4 years, Sarah Jessica Parker. His latest project saw him don a trenchcoat as Inspector Gadget, along with Rupert Everett as Claw.